Recently, one of our esteemed customer visited Shimla with his family. They were on vacations. They decided to book a ride with us. So, we picked them up on 18 Aug 2015 at 11AM from Chandigarh Air force Station. It was a 2N/3D tour. We picked them, and started for our journey instantly. It is about the 135km journey from Chandigarh to Shimla via Solan by road. Shimla is situated at an altitude of 2,205 meters. While Jakhoo Temple is situated at the highest altitude in Shimla i.e. 2,454 meters. After 4 hours long journey from Chandigarh, we reached Shimla. We checked in The Clarkes Hotel, Shimla at about 3:30PM. The hotel was located near Mall Road, Shimla. It was Heavy Snow Fall that day. The family was surprised to see the variation of temperature between Chandigarh and Shimla. The Temperature was about 0°C. It was too cold there that they were forced to take out their winter apparels and were using heater in the room. So the family decided to stay in the hotel. 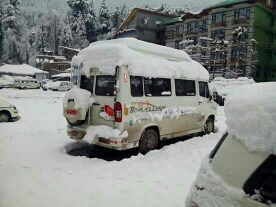 Shimla is the summer capital of Himachal Pradesh. It contains number of heritage buildings. The Clarkes Hotel as also one of the Heritage Building of Himachal Pradesh. Shimla is famous for its beauty and astonishing landscapes. So the next day, after having breakfast, the family moved on and covered many famous destinations like Mall Road, The Ridge, Christ Church and Jakhoo Temple (The highest altitude temple of Lord Hanuman). We had Langar at Jakhoo Temple. 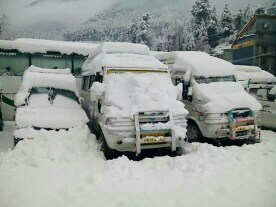 Whole Shimla was covered with the ice and was looking very amazing. We also visited lakkar bazar. In the evening, we came back to the hotel and enjoyed the dinner. Shimla is best known for most exciting and interesting mountain sports in the world due to the most number of peaks and valleys, rivers, trekking areas. These events are organized by Mountaineering Institute of Himachal Pradesh. The family decided to go out for some adventure. So they decided to enjoy famous adventures sports in Shimla. Fortunately, the weather was clear and suitable for the sports. So the family enjoyed Horse Riding, Ice- Skating, Trekking, Skiing and River rafting. The family had a great time and was feeling fresh and awesome like never before. That day, they all had the “live life off the edge” experience. In the evening, we checked out Clarkes Hotel at 7PM and started our journey back to Chandigarh. We dropped our clients at their destination at about 11PM. It was a wonderful experience for them. As per their feedback this tour was one of the most memorable moments they’ve ever had. Join us and be a part of most happy customer’s league!! !